ABB (www.abb.com) is a leading global technology company in power and automation that enables utility, industry, and transport & infrastructure customers to improve their performance while lowering environmental impact. The ABB Group of companies operates in roughly 100 countries and employs about 135,000 people. ABB is a pioneer in micro-grid technology with more than 30 global installations across a diverse range of applications serving remote communities, islanded grids, utility grid support and industrial campuses. 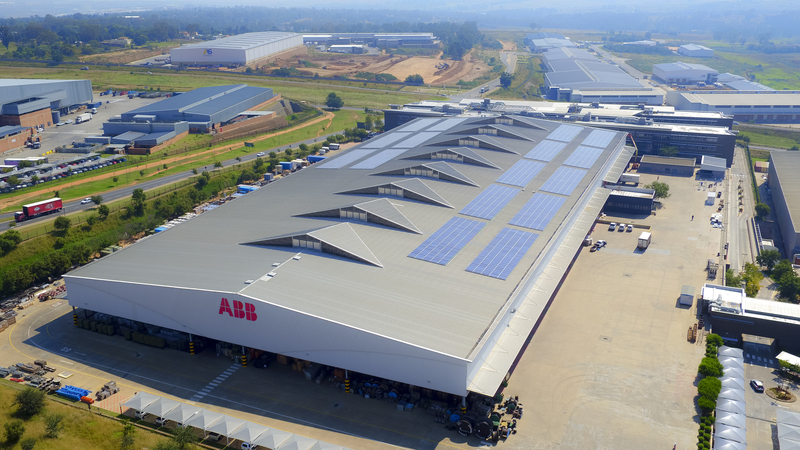 With a total of 96,000 square meters, ABB’s facility in Longmeadow (Johannesburg, South Africa) is the company’s country headquarters and a key manufacturing site for the firm. The power load is approximately 750 kW and the facility is grid-connected, but suffers from frequent grid outages that impact its operations and the power quality on site. Due to this, the facility has a set of diesel generators installed to cover for those disturbances. However, this is hardly an optimal and sustainable solution and so alternatives were being sought. Given the good solar resource on site, a 750 kW rooftop PV plant was installed to supply most of the facility’s electricity needs during the day. At the same time, and in order to maximise renewable energy penetration and reliability of power supply, a 1 MVA/380 kWh battery-based PowerStore solution was installed. This system allows for high renewable energy penetration and for smooth transitioning from grid-connected to off-grid mode in the event of a grid outage. The solution results in a significant reduction in the use of the backup diesel generators and in secure, reliable power supply provided by sustainable renewable energy generation. The ABB team studied the situation in detail to come up with an optimal design in terms of solar and battery sizing. In addition to system size optimisation, the main challenges were integrating different energy sources and ensuring automatic system operation to balance energy loads from solar, battery, diesel as well as the grid and to provide overall power stability in the micro-grid. The solution includes a cloud-based remote service system that allows for continuous real-time monitoring of system performance and for early detection of events and required maintenance activities. Technical support is available locally and site visits are available on demand to interested parties. The project was financed by ABB’s own resources and proves the economic viability of such systems in the region. The project has proven the technical viability of complex system integration in micro-grids, as well as the benefits of integrating renewable energy and battery-based solutions for an optimal energy mix and increased reliability. With many commercial and industrial applications in Africa suffering from low power quality and high reliance on backup diesel generation, grid-connected micro-grids provide a strong solution that addresses those challenges in an effective way.